Those who have tried to run Android-x86 on Virtualbox before probably know its Internet connection is not playing well together with Virtualbox. 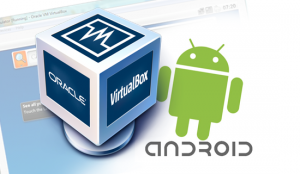 Here's a good news, Daniel Fages is building Android operating system which support to run in Virtualbox named 'Buildroid for VirtualBox'. After trying it, this is the best Android virtual machine I have tried so far. Everything is working, including Internet. 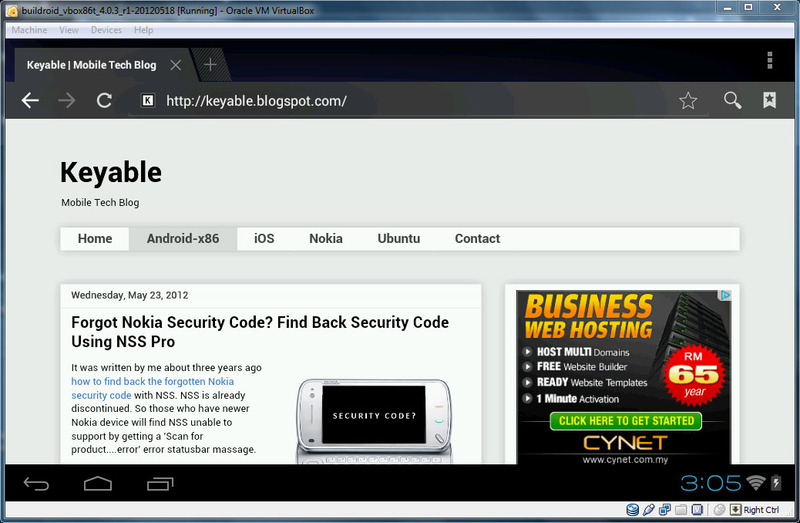 Click Choose... button and open the downloaded .ova Android VirtualBox image. Select Buildroid and click Start button. Done. Have fun with the Android operating system. - Press right Ctrl to regain mouse control on computer. - To unlock screen after being idle, press the ESC key and slide with mouse. Or, you can disable the screen lock (Settings > Developer options > enable Always stay awake). Hi @hsnmck , display auto-rotate 180 degrees is a bug in Android 4.0.3 Buildroid. The bug has been fixed in version 4.0.4. You can disable the auto-rotate function, Settings > Accessibility > uncheck Auto-rotate screen. I can't get a lot of apps in the Play Store. I would like to start with Firefox. I've tried changing the screen resolution of Android in VB, but that didn't help. It's not the Android screen resolution problem. It is the incompatibility of our x86 platform CPU trying to run some Android apps which compiled only for other kinds of processor. For example, Angry Birds is an ARM apps specially compiled for ARM processors. So the Play Store states the app isn't compatible with our Android-x86 in VB, if without any tweaks. Thanks for the tutorial first of all !
" You havent accessed the Google play app store on your device with this email account "
Any tip who to solve this ? Thanks. Any way to 'tweek' Ax86 and get them to work? 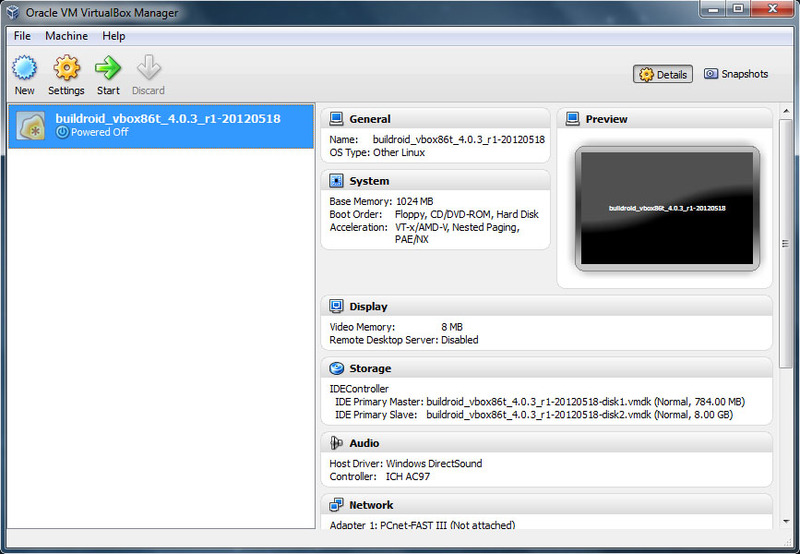 Buildroid managed to get ARM apps running on Android x86 platform. You can read more on here. It is still a test version, not all ARM applications are guaranteed will work. I tried to install Firefox but no luck. Hi @randomguy , this is known bug in version 4.0.3. It has been fixed in version 4.0.4. Enjoy. vbox86t : Built for a “tablet”, 1024×600 default resolution. and it i change the ram to 4XXMB because i only hav 1gb ram. and stuck at :booting the kernel. same, with my intel centrino mobile. Hi @अनिल कुमार , your CPU is AMD processor? I HAVE DONE THE DOWNLOADING .AND AM ABLE TO ACCESS NET ,BUT WHEN WE INSTALL SOMETHING FROM NET THROUG THIS ITS SHOWING THAT THE PHONE IS NOT DETECTED TO RUN THIS APP...HOW CAN I RECTIFY THIS PROBLEM??? Thanks for this! This almost only way it worked with instant network access. I tried Android -x86 but no network at all. The best Android VM so far. What is the application you trying to install? Just curious. That is the limitation of the current Android x86. Some apps don't work on x86. Are you running on AMD processor? What exactly is the problem with AMD processors on Android-x86? Hey i can't open this why? I want to add a sd card to the buildroid. Can you explain how? I think it's already included with a virtual sdcard. Go to Settings > Network, under Adapter 1 tab, change to Attached to: NAT. how do i connect adb? If you're using Windows, this post should guide you through. Try the newer Android Jelly Bean version and see whether you can access Internet or not. Using buildroid_vbox86t_4.0.3_r1-20120518_gapps.ova I'm unable to use bluetooth. I installed Youtube and Google Maps via Goolge Play. why i cant connect using buildroid_vbox86t_4.0.3_r1-20120518_gapps.ova ?